Nisbets Catering Equipment Blog - Industry news, trends, recipes and more! : How 3D Printing Food Works - Is it a Novelty or the Future? How 3D Printing Food Works - Is it a Novelty or the Future? You’ll have heard of 3D printing by now. Machines have been printing things like furniture and even prosthetic limbs since the 80s. But imagine walking into a restaurant, designing your meal on a computer and watching a printer create and serve your food right in front of you. It could happen sooner than you think as 3D food printing technology has already hit the restaurant scene. What’s 3D Food Printing & How Does it Work? Like the microwave in the 70s, edible printing has made waves in the food industry. Engineers and chefs have worked closely together to combine science with food by mapping out a set of 3D blueprints on a computer which can be created by the edible printer. But how does 3D printing food actually work? Liquidised food is placed in the printer’s food cartridges and squeezed through food-safe syringes. These syringes stack layer upon layer to give you the pattern created by the blueprint. And this is where it gets tricky: chefs must craft a liquid thick enough to stand tall after printing, yet remain thin enough to squeeze through the miniscule 1.6mm syringe needle. Does this sound like something you'd like to try? Food Ink recently opened its doors to an exclusive group of guests in East London. The three-day event brought together chefs, designers and engineers tasked with serving a nine-course meal prepared by Michelin-starred chefs Mateo Blanch and Joel Castanye. BBC Radio 4 recently reported on 3D food where restaurant founder Antony Jasinksi, described the process as “a pastry chef who squeezes a pastry bag to put icing on a cake to say Happy Birthday”. So could this be the future for dining-out? Only if you’re willing to dig deep into your pockets. Each guest of Food Ink’s pop-up event shelled out £250 for the innovative night, not something you’d be willing to make a habit of. Is 3D Food Printing Exclusive to Fine Dining? This evolving method of food production has definitely breached gourmet spaces. If done properly, 3D food printing can have a big impact on the productivity of professional kitchens, which is why a handful of chefs want to get their hands on an edible printer. Fine dining is all about mise-en-place with every bit of food having a specific place on your plate. The 3D printer’s robotic nozzle offers speed and precision you wouldn’t be able to replicate by hand. Intricate patterns, details and flamboyant designs are an edible reality, pushing the idea of food and fine dining to a whole new level. But if 3D printing becomes the norm and endless streams of perfectly formed meals are served day in, day out, would fine dining become less exclusive? Probably not. 3D food printers cost up to £7,500 and that’s a huge spend for a piece of technology that can’t do much more than craft perfect patterns with liquidised food. You’d still be far better off investing in staff who can take on a whole range of tasks. Once this technology is faster and produces better tasting food, then maybe we’ll see a boom in sales. For now though, it seems to be the new play toy for a handful of chefs looking to combine the precision of technology with creativity and cuisine. So if edible printing isn’t hitting high street restaurants any time soon, is it more of a novelty? Advocates of 3D printing claim it’s the future. And it's easy to see where they’re coming from. When you think of airline food, you imagine something inedible that you wouldn’t touch with a…well, knife and fork. But edible printing could have a huge impact on airline food, for the better. An on-demand food system gives passengers the freedom to choose what meal they want, adapt it to their needs and have it freshly made on their flight. The potential doesn’t stop there for 3D food printing, there’s a huge market for consumers too. Pre-prepared food cartridges created by professional chefs give consumers the chance to taste fine dining at home. Forget recipe books and dodgy attempts at mimicking extravagant dishes. Those who aren’t as graced as others with the natural-chef-gene need only press a button on their edible printer to recreate their favourite recipes in their own kitchen. 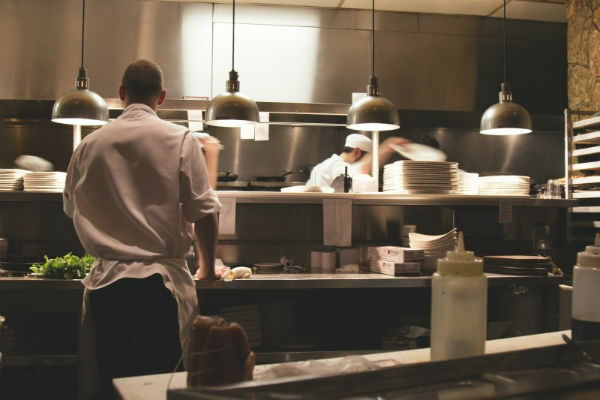 The progression of computerised technology shouldn't be viewed as a threat to the role of the chef. 3D food printers are an appliance, much like a blender, that chefs use to get their creative ideas on a plate. Wherever you see 3D printing food in the future, there is undoubtedly a huge scope for its continual development.